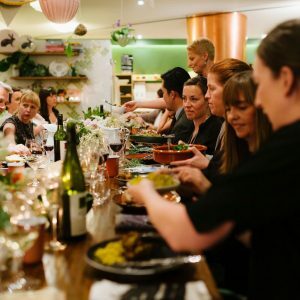 The very best Corporate Cooking Classes and events. Please click here for more detailed information. Are you looking for an absolutely fabulous personalised function, Christmas celebration or team building activity for your team or very special client’s? Our corporate cooking classes south of Melbourne (located in Melbourne’s bayside suburb, Cheltenham) are the perfect solution. Relish Mama is the perfect team building activity. 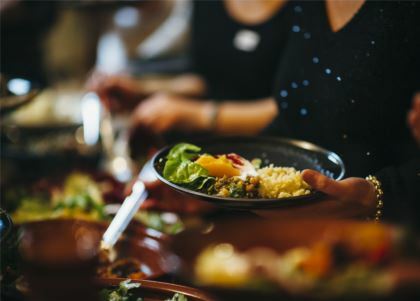 We can create an event perfect for your private group be it from a cooking class followed by an intimate dinner to corporate cooking team challenges which encourage communication, problem-solving, productivity and group morale. Gathering together at our stunning long table instantly connects people. It is an incredible and unique experience and the benefits from such an event flow back to the workplace. To offer the best corporate cooking classes near the CBD, we provide a venue that is filled with everything you need to cook up a masterpiece. It is beautifully fitted out for boutique functions, corporate cooking classes, product launches, photo shoots, book launches, television filming or intimate special events. Contact us and let us help you put together an experience that you will be talking about for years to come! Classes are a minimum charge for 10 people (Jan – Nov) and 12 people (Dec). We can accommodate up to 35+. For larger groups, alternative arrangements may be made and a class designed accordingly (additional costs may be incurred for venue hire for much larger groups). Popular classes for corporate and private events are Moroccan, Middle Eastern, Vietnamese, vegetarian cooking, Thai, Christmas cooking classes, Spanish and tapas, Midweek inspiration, Italian classes (including pasta making), Mexican cooking classes, Spanish, Barbecue masterclasses and of course, our popular mystery box challenges. A health and vitality workshop designed for your workspace and team is also a popular choice. It is worth noting that a class can be designed specifically to meet your needs or you can choose from any of the fabulous classes on the current timetable, which can be run exclusively for your team at a mutually agreed date and time. For the best corporate cooking classes easily accessible from the CBD and surrounds, please Contact Us at Relish Mama. Our corporate cooking classes south of the CBD are priced per guest on exclusive book out with a minimum charge for 10 attendees. During the month of December, our minimum charge is for 12 attendees, regardless of lower numbers. Should you want to really impress your team or clients, Relish Mama have premium corporate packages available that are a very special way to get together with your team and/or clients for an activity they will not forget. This package includes premium wines, French champagne, canapé’s upon arrival and transport to and from your event- POA. The Relish Mama team are also happy to assist with making any transport or accommodation requirements that you may require. Sign up to our delicious news. All rights reserved. © 2018 Relish Mama. Signed copies available from our online store. Delicious dishes to prepare and cook in under 15 minutes.